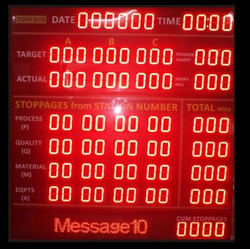 We also manufacture various kinds of displays like Token Displays, jumbo displays, parameter display, pollution displays, bank displays, scrolling displays, message display etc. 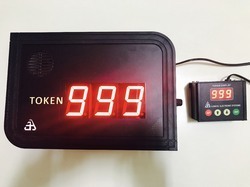 These Token Displays are one of the most useful products in our industries which are mainly used in banks, currency exchange counters, receptions, hospitals, clinics etc. Ajinkya Electronic Systems are one of the leading manufacturers of multiple products offered to OEMs as well as consumers. we are also a manufacturer, exporter, wholesaler and supplier display systems. our wide range of wide range of Industrial Programmable Indicator is and on display, air monitoring display, indicators, scoreboards, product displays, parameter displays, alphanumeric displays, weighbridge display, information display, automobile displays, scrolling displays, bank rate displays, multicolor displays, etc much more. these industrial programmable indicators are highly used by industries for monitoring industrial process systems. 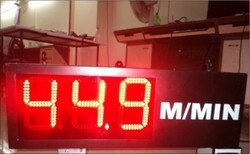 this unit has 4 digit display for parameter indication. Ajinkya Electronic Systems have developed & designed Andon Display System for OEMs. These units are used for Production Line to indicate and monitor problem occurs while Production. Green signals completion of Production, Yellow Signals Shortage of material, and Red Signals stoppage of Production. Dustproof membrane keypad for programming. Serial RS485 Output to connect Remote Display. The plants require parameters to be displayed at remote locations with large characters size. 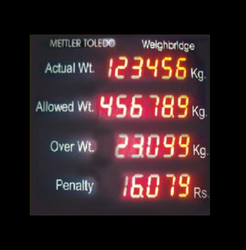 We deal in offering Display System that demonstrates parameter readings in various sizes. These displays connect on two wire interface from the logger and can be at a distance up to 1 km from the logger. A wireless connectivity using RF is also possible as per the application requirements of the clients. Information Displays are a substitute for old notice board displays wherein multiple lines numeric and alphanumeric information can be displayed electronically. 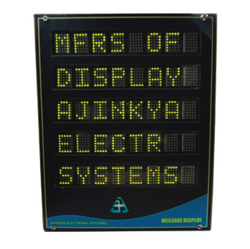 Ajinkya Electronic Systems are the manufacturer of LED Display Board since 1988. 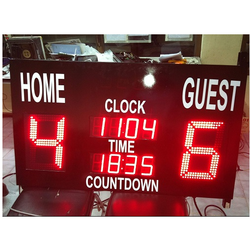 These Displays are to monitor scores in any sports like Kabbadi, Cricket, Football, Volleyball, Basketball etc. These displays can be manufactured as per clients requirements. Our sizes of LEDs are 1inch to 1 feet and can be viewable from long distance as per sizes. We are one of leading manufacturer, exporter, a supplier of Display systems. LED Display for Production is used by OEMs for the Industrial process to monitor production process. This display monitors Actual production was done, remaining production, Target etc. Ajinkya Electronic Systems are a manufacturer, exporter, supplier of Display Systems. Our Large LED Display is manufactured under highly skilled professional Technical Team. 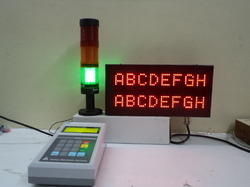 These displays are also known as product displays, information displays, jumbo displays, jumbo indicators, production indicators, information indicators, industrial indicators, jumbo led displays, large display, large display indicators, indicators, parameter displays, pollution display, parameter led display, parameter indicators, pollution indicators etc. These are highly used in industrial process indication systems. We are the well-known manufacturer, exporter, supplier, the whole of Indicators. 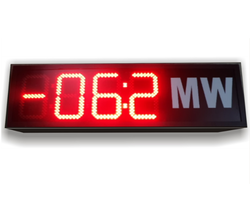 Mega Watt Indicators are also Known as a jumbo indicator, Jumbo Displays, Led Displays, Digital Displays, Large indicators etc. These indicators are viewable from the long distance. They are manufactured by our quality and experienced team we manage to manufacture these indicators in various sizes as per client requirements. We manufacture and export Parameter Displays. In industrial applications, various parameters like temperature, pressure, flow, humidity or electrical parameters like voltage, current, frequency etc are to be displayed to be viewed from greater distances. These parameter displays can accept multiple inputs so as to work as Jumbo display scanners. Various inputs possible like RTD / Thermocouples / 4-20mA / Pulses / Voltages / Current / Humidity etc. 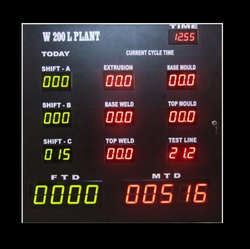 Ajinkya offers Production Displays to show information like production count, turn around time, shift count, total production, efficiency etc. as per user requirement. These displays are also termed as Andon displays. These production displays are custom built to suit user requirement. Storage of shift production, total production during the day, production during month etc. 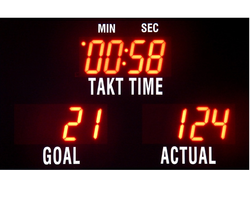 Ajinkya electronic systems is manufacturer and designer of Scoreboard Displays for sports and factory applications. 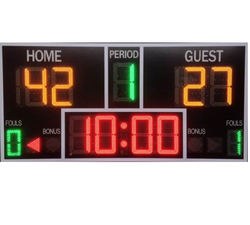 Currently we supply scoreboards to a wide variety of sports like boxing, kabaddi etc. In fact, Ajinkya Scoreboards can cater for any competitive sport where score keeping and timekeeping is an important feature of the game. 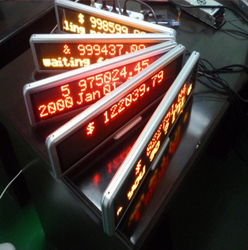 message display, jumbo display, token display, alphanumeric displays, information displays, production displays etc. Scrolling Message Display is highly used by railways, buses for information etc. We manufacture and exports quality assurance products to our clients. 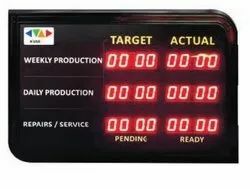 Takt Time Display enables you to set the pace using your takt time and monitor your production with an immediate understanding of whether you're ahead, behind, or right on schedule. 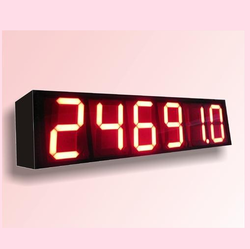 Ajinkya Electronic Systems are one of the leading manufacturer, exporter, supplier of temperature display for industries. 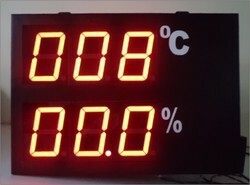 Temperature Display for Industries display is used to monitor temperature parameter in an industrial process. it can be manufactured in various shapes, sizes, and colors as per client requirement. these displays are viewable from a long distance. Our Industries always requires of huge displays to monitor Temperature, parameter etc. Temperature Monitoring Display is manufactured by a professional technical team. It can be manufactured in various shapes, sizes, colors as per clients requirements. It Jumbo Digits is easily viewable from long Distance. 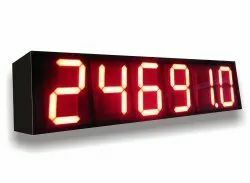 Ajinkya Electronic Systems are a manufacturer, exporter, supplier, Wholesaler etc of LED Display Indicators, Large Display Indicators are also known as jumbo indicators, Production Indicators, Parameter indicators, display systems, large view indicators, led indicators, pollution indicators etc. Our clients are Tata, L & T, Godrej, Philips, ACC, Nirlon, Bajaj Auto Limited, Nestle, Coca-Cola, J.k White cement, Mahindra, Ranbaxy, Kirloskar, much more. Looking for Display Systems ?